Everyday Ways You Break the Law #Infographic ~ Visualistan '+g+"
While the vast majority of us will of course abide by the laws, it is surprisingly easy to break a few. Even some of the most conservative and good-natured people will sometimes break the law by accident, whether it’s because it’s a fairly common way to break the law, so it doesn’t seem so terrible, or the law is not well known. Our latest infographic explores these laws that are less well-known or perhaps are broken more than others. For example, even though it is common knowledge not to drink alcoholic beverages and drive, it’s actually illegal to drink anything while driving, even water. Also, while it is known that speeding is against the law, the vast majority of people will do it at some point, even if it’s intentional such as when overtaking a cyclist. 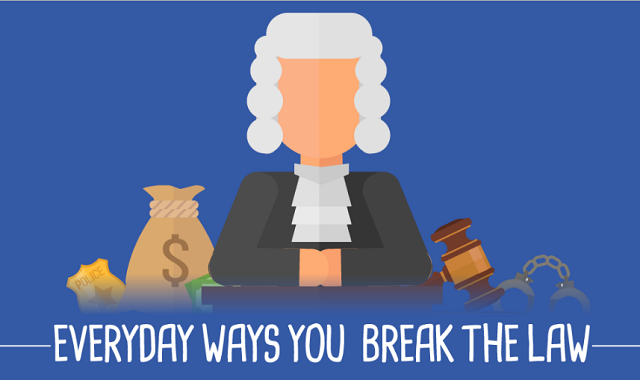 Take a look at the infographic below to find out more about the laws you’re most likely to break every day.